This Strategic Plan has been nearly ten months in the making. The process began in earnest in August 2016, with a comprehensive analysis of the strengths, weaknesses, opportunities and threats facing Cushing Academy. The results of that analysis showed that Cushing needed to focus on nine distinct strategic initiatives to ensure that the founding ethos of Cushing Academy, enunciated so clearly by Thomas Parkman Cushing in 1850, remained at our core, while recognizing and adapting to the profound changes in our world that have occurred since then. The strategic planning process was intentionally designed to optimize input from students, faculty, staff, parents, alumni and the Board of Trustees. Thoughtful input from these Cushing stakeholders resulted in 27 iterations of this Strategic Plan. Our final Strategic Plan is ambitious, but it will help us map a sustainable future, steward our resources more effectively, and emerge a stronger institution that is best positioned to achieve its mission for our students. Our Strategic Plan is posted on this page. A more comprehensive version of the Strategic Plan, which includes historical perspectives and specific action steps required to achieve identified objectives, can be found by clicking here. The Board of Trustees is deeply grateful to all who lent their insight and ideas to the Strategic Plan. We are especially appreciative of the efforts of those who served on the NEASC Standards Committees and integrated their work on the Self-Study with the formulation and evolution of the Strategic Plan. Strategic planning is essential to any School’s long-term sustainability and priority setting. It enables the Board of Trustees to measure performance of strategic initiatives and objectives and hold staff accountable for implementing action steps to achieve the objectives and initiatives. In turn, a formal strategic plan enables the Head of School to implement the tenets of the strategic plan in a transparent and sequential manner while making necessary adjustments to the operating plans that become the responsibility of the School’s leadership team. Given the absence of formal planning for a number of years on campus and the upcoming NEASC Site Visit November 5–8, 2017, the Board in partnership with the Leadership Transition Team determined it expeditious to incorporate the eight Strategic Planning Work Groups into the NEASC Self-Study Process. The Strategic Planning Work Groups/NEASC Standards Committees provided essential input into the development of the Cushing Strategic Plan, and enabled faculty and staff the opportunity to engage in professional development while concurrently modeling institutional collaboration. Each NEASC Standards Committee was assigned a Strategic Plan objective related to the particular NEASC Standard. The Strategic Planning Work Groups/NEASC Standards Committees were charged to meet, deliberate, and complete the Work Group Reporting Templates. The final iteration of the Reporting Templates was forwarded to the Leadership Transition Team and the Pappas Consulting Group with a copy to the Board Chair on or about April 14, 2017. This input became an integral part of the Strategic Plan. Subsequent, iterative work steps were then undertaken as outlined in the timeline that follows. Initial Draft Strategic Plan developed by the Pappas Group as the result of input received from approximately 500 stakeholders, interviews, focus groups and surveys throughout the fall semester as well as existing documentation. Initial Draft Strategic Stakeholder Review Process created to engage the Cushing faculty and staff in crafting action steps required to complete each objective in the Initial Draft Strategic Plan. Decision made to integrate the Strategic Planning Work Groups within the NEASC Self Study. Responsibility given to the Leadership Transition Team to implement the process timely. Draft process design presented to the Board of Trustees for input. Revisions to the Initial Draft Strategic Stakeholder Review Process and material completed in partnership with the Board of Trustees and Leadership Transition Team. Initial Draft Strategic Plan presented to the Board of Trustees at its February 3, 2017 meeting. Strategic Planning Work Group Agendas and Templates prepared for Strategic Planning Work Groups/NEASC Standards Committees. Leadership Transition Team charged with distribution and timely follow up. Strategic Planning Process presentation created by the Pappas Group and provided to the Leadership Transition Team to use as a tool to communicate to Cushing faculty, staff, students and external stakeholders. Strategic Planning Work Groups/NEASC Standards Committees meet 2-3 times to work on their respective Draft Strategic Plan Templates. Strategic Planning Work Groups/NEASC Standards Committees release Draft Strategic Plan Templates to Co-Head of School Academic Affairs and Student Life and other Leadership Transition Team members for review and comments. Strategic Planning Work Groups/NEASC Standards Committees release updated Draft Strategic Plan Templates to the Leadership Transition Team, and the Pappas Group. Pappas Group provides input for clarity and completeness. Strategic Planning Work Groups/NEASC Standards Committees provide Second Draft Strategic Plan Templates to Leadership Transition Team for input/amendment. Strategic Planning Work Groups/NEASC Standards Committees forward Third Draft Strategic Plan Templates to the Leadership Transition Team, the Pappas Group and Chair of the Board. Based on input from Cushing Academy stakeholders, Pappas Group prepares First Working Draft Strategic Plan for Board of Trustees review. Pappas Group forwards First Working Draft Strategic Plan to the Board of Trustees and the Leadership Transition Team for amendment. The First Working Draft Strategic Plan is reviewed by the Board of Trustees at its April 21, 2017 meeting. Comments to the First Working Draft Strategic Plan by the Board of Trustees forwarded to the Pappas Group. Revisions made to the initial draft by the Pappas Group. Second Working Draft Strategic Plan uploaded to webpage for community input. Pappas Group collects community input and amends Second Working Draft Strategic Plan, as needed. Final Draft Strategic Plan presented to the Board for further amendment/approval. 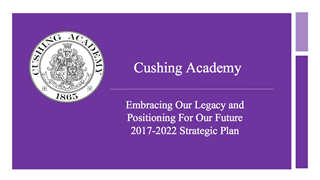 Final Strategic Plan released on dedicated Cushing Academy webpage.